President Trump tapped Brett Kavanaugh, an influential conservative judge who has had a hand in a number of consequential environmental decisions over the past dozen years, to be the next Supreme Court justice. 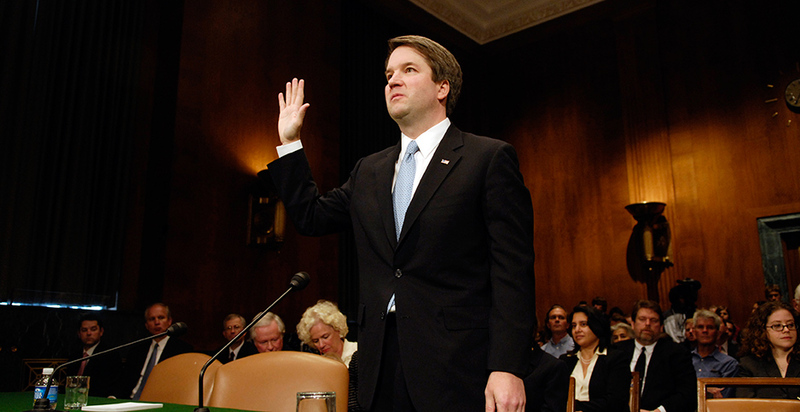 If confirmed, Kavanaugh would replace outgoing Justice Anthony Kennedy, who announced his retirement late last month after three decades on the high court. "There is no one in America more qualified for this position and no one more deserving," Trump said when announcing the nomination in a prime-time event in the East Room of the White House. Kavanaugh, who has been a judge on the U.S. Court of Appeals for the District of Columbia Circuit since 2006, accepted the nomination with his wife, Ashley, and daughters Margaret and Liza by his side. He called himself "humbled" and "deeply honored." "My judicial philosophy is straightforward: A judge must be independent and must interpret the law, not make the law," Kavanaugh said. Democrats have vowed a fierce confirmation fight for the 53-year-old nominee from Maryland, who got his political start as one of the lead lawyers for independent counsel Kenneth Starr's investigation of former President Clinton. His role in the investigation, and his subsequent work for the George W. Bush administration, is likely to come up during the confirmation process. Progressive groups and environmentalists also swiftly decried Kavanaugh's nomination, joining a rally at the Supreme Court immediately after the announcement. "President Trump had the opportunity to nominate someone who would be fair-minded and maintain the balance of the Supreme Court," League of Conservation Voters President Gene Karpinski said. "Unfortunately, with the nomination of Brett Kavanaugh, Trump has nominated an individual whose record shows he will side with the wealthy and powerful over the public interest." Before his nomination was announced, some conservatives expressed concern that Kavanaugh was not conservative enough, pointing to some rulings on health care and abortion. But Kavanaugh had barely left the East Room of the White House before conservative groups began to pour money into campaigns to boost his nomination. The Judicial Crisis Network announced that it would spend an initial $1.4 million in support of Kavanaugh on national cable and digital ads in three states facing tight races with seats that could flip to the GOP — North Dakota, Indiana and West Virginia — and Alabama. The group previously spent $7 million to block Merrick Garland, President Obama's Supreme Court pick, and had a $10 million campaign to support Justice Neil Gorsuch, Trump's first high court nominee. The Koch brothers-connected Americans for Prosperity also announced a seven-figure ad campaign targeting West Virginia, North Dakota, Indiana, Florida, Missouri, Pennsylvania, Montana, Ohio, Michigan and Wisconsin. Kavanaugh comes with a deep record — more than 300 opinions and a number of dissents — on the D.C. Circuit, which will undoubtedly be picked apart by Democrats, environmentalists and other outside groups in the days and weeks to come. Of the final four potential nominees, all of whom were deeply conservative, Kavanaugh boasted by far the most environmental law experience. He's touched almost every major environmental issue: His record includes complex air cases, Endangered Species Act challenges and highly technical Federal Regulatory Energy Commission claims. He's seen as skeptical of expansive environmental rules and rebuffed some of the Obama administration's major air rules during his 12 years on the court. "EPA exceeded its authority" is a refrain that has appeared often in his opinions and dissents on environmental regulations. In a 2012 dissent of a decision to rehear a case on EPA greenhouse gas regulations, for example, Kavanaugh wrote that the agency had acted counter to the Clean Air Act. "In my view, EPA's reading of the statute was impermissible," he wrote then. "An agency cannot adopt an admittedly absurd interpretation and discard an eminently reasonable one." In the same dissent, Kavanaugh expressed concerns about the interpretation of Massachusetts v. EPA, the landmark Supreme Court decision finding that EPA had the authority to regulate greenhouse gases. The Supreme Court later agreed to review the D.C. Circuit's opinion, striking down portions of the rule on the grounds that EPA could force stationary facilities to obtain air permits based solely on their emissions of greenhouse gases. In 2014, Kavanaugh also dissented from his two Democratic-appointed colleagues in finding the Obama administration failed to consider the costs of EPA's mercury and air toxics rule for power plants. The Supreme Court agreed in a 5-4 decision, sending the rule back to EPA. He wrote majority opinions tossing out EPA's Cross-State Air Pollution Rule, vacating an EPA rule for cement kilns that shielded polluters from lawsuits for emissions during malfunctions and rejecting EPA's justification for reducing renewable fuel requirements. In the first, the Supreme Court overturned the decision, upholding the Obama-era rule. Kennedy joined the majority in the 6-2 opinion. And in 2017, Kavanaugh wrote the majority opinion finding that the Obama EPA had exceeded its authority under the Clean Air Act with a 2015 rule that eliminated some uses of hydrofluorocarbons, which are potent greenhouse gases. Environmentalists and two chemical companies have appealed the decision to the Supreme Court. "The takeaway message, for me, from all of these cases is that he will construe EPA authority very narrowly and virtually always, but not every single time, in favor of regulated parties and against environmental interests," Ann Carlson, an environmental law professor at UCLA, wrote last night. If confirmed, Kavanaugh would face an early test in environmental law. The Supreme Court announced yesterday that a challenge to the critical habitat designation for the endangered dusky gopher frog would be the first case of its fall term. But Kavanaugh's record is not always straightforward. In 2013, he signed on to an opinion finding that EPA's 2011 retroactive veto of a West Virginia mountaintop-removal mining project was legal. In 2016, however, he dissented from his colleagues in finding EPA had revoked the Clean Water Act permit "without considering the costs of doing so." Kavanaugh said he plans to begin meeting with senators today. "I will tell each senator that I revere the Constitution," he said yesterday. "If confirmed by the Senate, I will keep an open mind in every case, and I will always strive to preserve the Constitution of the United States and the American rule of law." Some Democrats said they would reserve judgment until meeting with Kavanaugh and reviewing his record. "He's had 12 years to show what he can do and to write a lot of opinions and co-author a lot of opinions. I'm not familiar with many of them at all," said Sen. Tom Carper (D-Del. ), who voted for Kavanaugh's confirmation to the D.C. Circuit in 2006 and is the top Democrat on the Senate Environment and Public Works Committee. "I've been told that his writings on decisions that pertain to the environment are not encouraging," he said. "So I'm going to take a chance to read them." But others, led by Minority Leader Chuck Schumer (D-N.Y.), have already announced their opposition to his nomination. Schumer slammed Kavanaugh as hostile to Roe v. Wade and said that Trump was "making good on his pledge to 'punish' women for their choices." "I will oppose Judge Kavanaugh's nomination with everything I have, and I hope a bipartisan majority will do the same. The stakes are simply too high for anything less," Schumer said. During the confirmation process, all eyes will be on Democrats who are facing tough re-election campaigns in red states and moderate Republicans. Sen. Joe Manchin (D-W.Va.): "Just as I did when Merrick Garland and Neil Gorsuch were nominated, I will evaluate Judge Kavanaugh's record, legal qualifications, judicial philosophy and, particularly, his views on health care. ... I believe the Senate should hold committee hearings; senators should meet with him, we should debate his qualifications on the Senate floor and cast whatever vote we believe he deserves." Sen. Heidi Heitkamp (D-N.D.): "I take this job incredibly seriously, and I expect the nominee to meet with senators, have a hearing and receive a comprehensive review of his record. ... I have no doubt that many members of Congress and outside groups will announce how they stand on the nominee before doing their due diligence and instead just take a partisan stance — but that isn't how I work." Sen. Joe Donnelly (D-Ind. ): "I will carefully review and consider the record and qualifications of Brett Kavanaugh." Sen. Susan Collins (R-Maine): Kavanaugh has "impressive credentials and extensive experience. ... I will conduct a careful, thorough vetting of the president's nominee to the Supreme Court, as I have done with the five previous Supreme Court justices whom I have considered." It took three years for the Senate to confirm Kavanaugh as a judge on the D.C. Circuit. But in an interview yesterday, Sen. John Cornyn (R-Texas) said he expected the judge to be on the high court bench within a "couple months," the more typical time frame for confirming a Supreme Court justice. Cornyn said he was optimistic that the nominee would get around 54 votes in his favor, the number that Gorsuch received last year. Manchin, Heitkamp and Donnelly all voted for Gorsuch. "I think they'll want to be re-elected. Those three are running in red states where President Trump did well and they are going to be torn, no question," Cornyn said. "My assumption is once they voted for Neil Gorsuch, it's not a great leap" to vote for one of the other picks on Trump's short list. Reporters George Cahlink, Nick Sobczyk and Kellie Lunney contributed.